Animation of the formation of the third ring. UCLA scientists explain the formation of an unusual third radiation ring that briefly appeared between the inner and outer Van Allen radiation belts in September 2012 and persisted for a month. 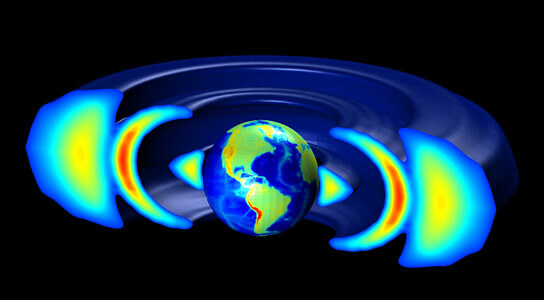 Since the discovery of the Van Allen radiation belts in 1958, space scientists have believed these belts encircling the Earth consist of two doughnut-shaped rings of highly charged particles — an inner ring of high-energy electrons and energetic positive ions and an outer ring of high-energy electrons. In new research, UCLA space scientists have successfully modeled and explained the unprecedented behavior of this third ring, showing that the extremely energetic particles that made up this ring, known as ultra-relativistic electrons, are driven by very different physics than typically observed Van Allen radiation belt particles. The region the belts occupy — ranging from about 1,000 to 50,000 kilometers above the Earth’s surface — is filled with electrons so energetic they move close to the speed of light. Shprits, who is also an associate professor at Russia’s Skolkovo Institute of Science and Technology, a new university co-organized by MIT, led the study, which is published September 22 in the journal Nature Physics. Model showing third radiation ring (red). Recent observations by NASA’s Van Allen Probes mission showed an event in which three radiation zones were observed at extremely high energies, including an unusual medium narrow ring (red) that existed for approximately four weeks. The modeling results, displayed in this illustration, revealed that for particles at these high energies, different physical processes are responsible for the acceleration and loss of electrons in the radiation belts, which explains the formation of the unusual long-lived ring between the belts. Shprits and his team found that on September 1, 2012, plasma waves produced by ions that do not typically affect energetic electrons “whipped out ultra-relativistic electrons in the outer belt almost down to the inner edge of the outer belt.” Only a narrow ring of ultra-relativistic electrons survived this storm. This remnant formed the third ring. After the storm, a cold bubble of plasma around the Earth expanded to protect the particles in the narrow ring from ion waves, allowing the ring to persist. Shprits’ group also found that very low-frequency electromagnetic pulsations that were thought to be dominant in accelerating and losing radiation belt electrons did not influence the ultra-relativistic electrons. The team performed simulations with a model of the Earth’s radiation belts for the period from late August 2012 to early October 2012. The simulation, conducted using the physics of ultra-relativistic electrons and space weather conditions monitored by ground stations, matched the observations from NASA’s Van Allen Probes mission extraordinarily well, confirming the team’s theory about the new ring. The Earth’s radiation belts were discovered in 1958 by Explorer I, the first U.S. satellite that traveled to space. The research team also includes UCLA postdoctoral scholar Alexander Drozdov, who works with Van Allen Probes observations; Kyung-Chan Kim a researcher from Korea who recently finished his postdoctoral studies at UCLA; UCLA assistant researcher Drew Turner, who provided data; researcher Maria E. Usanova of Canada’s University of Alberta, who provided critical observations of electromagnetic pulsations from the Canadian Space Agency-funded CARISMA ground network of magnetometers; and Daniel Baker a director of the Laboratory of the Atmospheric and Space Physics at the University of Colorado, who provided expertise on the analysis of data from the Van Allen Probes. The study was supported by NASA and also by the National Science Foundation and the University of California Office of the President. Be the first to comment on "Scientists Explain the Formation of the Unusual Third Van Allen Radiation Ring"